No one wants to be stuck manually opening his or her door day after day, or struggling with a door that is inconsistent, slow, or unusable. We offer repairs and installation of replacement parts on garage door openers, springs, rollers, panels, and whatever else your garage door needs to function smoothly and efficiently. A malfunction can occur in any of the moving bits and pieces that make up the inner workings of your door, and our staff is trained to handle all of them. We have years of experience with chain drives, belt drives, torsion springs, extension springs, screw drives, direct drivers, and jackshafts, just to mention a few. Don't take on the risk of performing potentially dangerous repairs to parts that our team is fully equipped to handle safely. The services we provide will ensure that you have top quality, smoothly functioning parts, no matter what kind you have. A broken garage door is a serious issue. 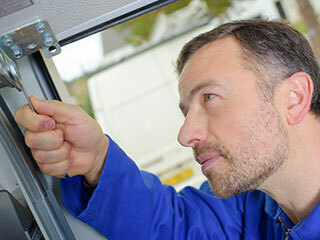 Our experienced technicians are qualified to provide you with excellent service on nearly any type of garage door, from its drivers and springs to its panels and rollers. We take pride in our fast and friendly service, and our decades of experience are put to work for you whenever you need a repair. We offer emergency repair and same-day service to make sure that you are taken care of the moment that an issue arises. Whether you need a new spring or a whole new door, count on the professionals at Garage Door Repair Rogers to handle your repair and installation quickly. Contact us to receive more information on our availability or to schedule your repair today.